Meet the team that’s helping turn your retirement goals into reality. Access customized solutions for enjoying your golden years to the fullest. Develop a smart plan for accumulating wealth and maximizing your assets. Find out how to leave a legacy for loved ones while managing your estate. I think that I am set now with the good account you got me into. It did originate from my 401-K in my "corporate years", before rolling that. It is always good hearing from you and I know you and Mercedes are always there (I sleep better at night)! Jim, every time I went to your house as a little girl to sell Girl Scout cookies or wrapping paper you bought 10x the average person! You generous, soul, you! ❤️. I love Jim Lee because you helped me help my Mom ❤️. You make me lots of money with great investments! I like the birthday lunches also! Jim is the best! Known him about 30 years and he has been of great help. Partnering with Jim Lee has developed into a relationship of trust and confidence, knowing that he will go above and beyond to give my clients sound retirement advice. All of the clients I have sent to Jim are extremely satisfied to know they will be able to retire with a solid financial plan. Just met Jim and he helped me more than I expected. He also is keeping me posted of what to expect. Thank you! Jim Lee took such great care of mom’s finances and made a big difference in her life. Jim does not have a cookie cutter approach. Rather, he listens to what I want and finds the right financial instrument to meet my needs. I am so thankful for Jim's advice and plan on staying with him for the long haul. Enjoying a comfortable lifestyle in retirement shouldn’t mean choosing between your future and your family’s. At Jim Lee Financial, we’ve spent more than 25 years offering low-risk, long-term solutions for helping our clients achieve financial peace of mind. Whether you’re only months from retirement or are just entering the workforce, contact us to serve as a trusted resource for aligning your needs with strategies to meet them. 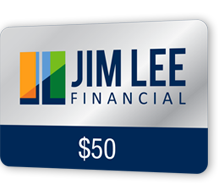 By consistently delivering on our commitment to treat clients like family, Jim Lee Financial is proud to have grown our business primarily on client referrals. If you have family members, friends or coworkers who are concerned about navigating market swings and preparing successfully for retirement, we can provide them with a no-obligation, complimentary consultation.